First song, first impression... This sounds like modern Deep Purple (Slaves & Masters era), perhaps a little faster.... And yes, guitarist Stuart Smith who is classical trained, grow up with Deep Purple's In Rock and later met Richie Blackmore who became his mentor. 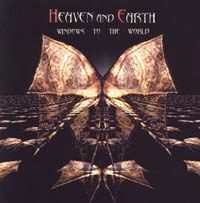 Stuart founded Heaven & Earth back in 1996. At his first album be worked with different musicians incl. Richie Sambora, Kelly Hansen and Joe Lynn Turner. Looking for a more band situation he was searching band mates and soon found Richie Onori (drums). Looking for a singer they accidentally found Kelly Keeling who was in e.g. Blue Murder and MSG. Kelly's bluesy voice fitted to the music almost perfect, next Arlan Schierbaum joint Heaven & Earth. Only a bass player was missing... During the recordings they got a helping hand from Tony Franklin, Chuck Wright and some others. I can recommend the following tracks to check 'em out: Prisoner, Politician and Worlds Apart.